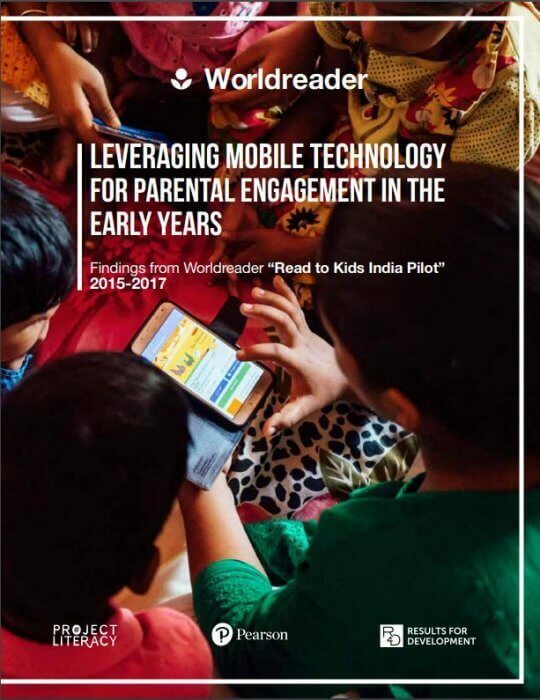 Between 2015-2017, Worldreader, Results for Development (R4D) and Pearson’s Project Literacy partnered to develop and implement a digital reading pilot called Read to Kids for parents of young children among under-resourced households in Delhi State. Read to Kids promoted emergent literacy and school readiness of young children 0-8 years of age by encouraging parents and caregivers to read aloud to their children. The pilot goals were to raise awareness of the value of reading to young children, encourage a culture of reading at the household level, and get parents reading frequently to their children. The Worldreader Kids app3 was designed, developed and launched containing an age appropriate digital collection of 550 children’s storybooks in both Hindi and English. These books were sourced from 34 different local and international publishers including Pearson, Katha, Tulika, Pratham Books and Eklavya. The application was promoted in Delhi using a blended approach consisting of partners on the ground, a behavior change campaign and digital marketing. The program aimed to reach 200,000 families and learn how to best encourage and support parents and caregivers in reading to young children. Worldreader partnered with organizations with an established presence and positive influence in 177 small communities across Delhi. All partners promoted reading and aimed to improve the knowledge, attitudes and reading behaviors of parents and caregivers in the target group. A behavior change campaign tested messages and competing distribution channels to learn how to best reach and influence parents cost-effectively. The campaign आज की कहानी, कल की तैयारी – meaning “today’s stories are tomorrow’s preparation” developed program support tools for partners (flyers, posters, banners, and reading cards) with a common brand, as well as messages for broader channels such as radio, local cable TV, outbound dialing, billboards, Google Ads, YouTube and Facebook. Messaging for the campaign was developed based on the findings of the formative research and existing parental attitudes and behaviors towards reading. Campaign messages that resonated most with parents were those that focused on the importance of reading for school readiness and the teaching of early language and learning concepts. Outcome evaluation. Quarterly Learning Checks were lead by R4D and Worldreader and brought together all partners in Delhi to evaluate progress towards desired outcomes based on both back-end and field data. An independent outcome evaluation was led by the Centre for Early Childhood Education and development (CECED) from Ambedkar University in Delhi between November 2016 and June 2017 to measure short-term outcomes. Formative research at baseline concluded the majority of children in our target group lived in a home literacy environment absent of children’s storybooks. Digital reading is scalable and affordable. Women became important and indirect beneficiaries of the pilot. Books in Hindi (bilingual or Hindi only) were the most-read books on the application. Leveraging in person, digital and media assets together best foster attitude and behavior change in parents.